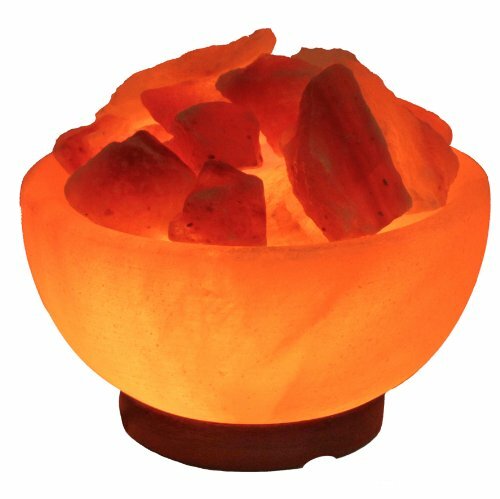 IndusClassic LFB-04 Fire Bowl Shape Himalayan salt crystal lamp emits a number of negative ions into surrounding atmosphere when it is heated by an external source of electric or candles. The heat produced breaks down Na CL Sodium Chloride in a process called ionization. This process is enhanced by natural process of Nacl and resulting in the production of negative ions which eliminate the positive ions that are present in our surroundings that are continuously produced by common household items such as, Computers, refrigerators, T.V sets, etc. Thus these salt chips make the air clean, fresh and healthy to live. 1- Please make sure the switch is turn on status before use. 2- Please wipe outside surface with a dry cloth and then light it up, as Salt Crystals may dissolve slightly if it's not used for a long time or under humid environment. 3- Each lamp may be slightly different from the image product in color or size due to the natural variation in Himalayan crystal salts. 1* Exceptional Quality And Beautifully Designed Indusclassic Brand Packaging Which Explain In Detail Product Benefits & Technical Detail. 1*Product Manual with detail how to operate and maintain product. SALT LAMP - Each Fire Bowl Salt Lamp Comes With 15-watt Bulb And 6-feet UL Listed Electric Cord With Dimmer Control Swith. Fire Bowl Estimated Ions effectivete area 50 - 55 Square Feet. REDUCE ASTHMA & ALLERGY SYMPTOMS - Reduces microscopic particles of dust, pet dander, mold, and mildew from the surrounding air creating the ideal environment of health. NEUTRALIZE ELECTROMAGNETIC RADIATION - Negative ions from Himalayan salt lamps neutralize electromagnetic radiation from electronics which cause fatigue, decrease immune response, increase stress. If you have any questions about this product by Indus Classic, contact us by completing and submitting the form below. If you are looking for a specif part number, please include it with your message.